Monica Monday – What to Wear to Workout AND Date Night? 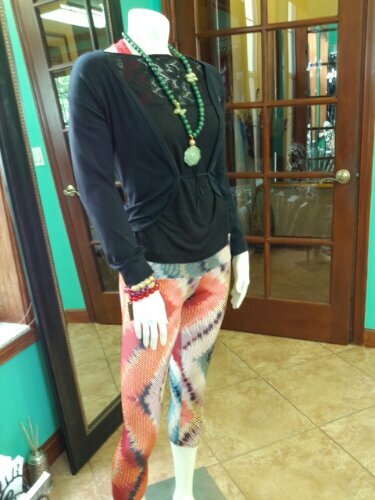 The NEW Palm Beach Athletic Wear Boutique, features Monica (our mannequin). Each week, Monica will try on and sport the latest looks YOU must have. These fitness outfits are meant to be worn to work out in however, PalmBeachAthleticWear.com yoga clothing can go beyond working out and you can sport our fitness wear beyond the gym and yoga studio for a night out at the clubs, date night with your guy, brunch with your gal pals and much more. Palm Beach Athletic Wear asked our fans, what THEY would like to see Monica wear today, and the overwhelming response from our fans and readers was awesome! One fan, challenged us to find a look that could be worn for cross fit, yoga and an occasional date night with her husband. Our Fitness Fashion Stylist, Zoe didn’t have to hunt long to pull together a fabulous look that works for the gym and looks equally pulled together for dinner at a posh, Palm Beach restaurant. Accessories were key to pulling off this look for the gym and switching up this look for a night out. For working out during the day: Protokolo red sports bra, soundwave capri pant. For date night with the hubs: Add a gorgeous lace top and simple, black cardigan and some bling from Angelica Smith Jewelry.